Are you tired of laboring away at your local retail pharmacy? Wouldn’t you rather work in a hospital or long-term care facility? 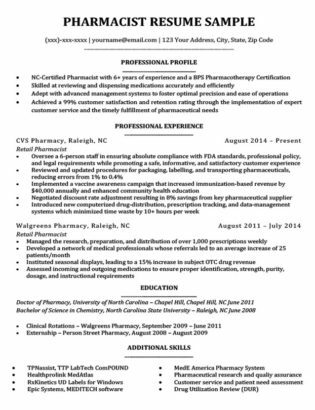 Our pharmacy technician resume example and specialized writing tips will help you take your career to the next level. On the other hand, if just the idea of spending hours crafting the perfect resume is giving you a headache, feel free to use our resume builder to get it done in minutes! Not quite what you’re looking for? Take a look through our list of proven resume samples for to find what you need. Want to inject some style into your resume? Check out our resume templates for some classy designs. Ready to start crafting your cover letter? Our impressive cover letter samples are sure to give you the helping hand you need. Certified Pharmacy Technician with 5+ years of experience filling prescriptions, processing insurance claims, and maintaining customer relations in high-traffic pharmacies. Seeking to use long track record of excellent customer service, as well as advanced pharmaceutical knowledge and training to fulfill the role at your pharmacy. Possess Sterile Products (IV) certification and Massachusetts pharmacy technician license. Measure, mix, and add nutrients and drugs to IV solutions, preparing an average of 11 IV packs per day, and request restocking of intravenous supplies when necessary. Whenever you’re writing a resume, you need to think about the fact that you are just one of many people applying for that position. Your ultimate purpose then is to create a resume that makes yourself stand out from the crowd. Ask yourself: what skills, knowledge, and training do pharmacists value most when hiring a pharmacy technician? Instead, you should think about which pharm tech duties, skills, and knowledge are most useful and most desired by the pharmacist. By highlighting all the aspects pharmacists value most, your resume will set you apart the instant they lay eyes on it. The remaining tips will show you exactly how to accomplish this in each section of your resume. Take a look at our guide on how to write a career objective for a more detailed explanation on creating the perfect structure. 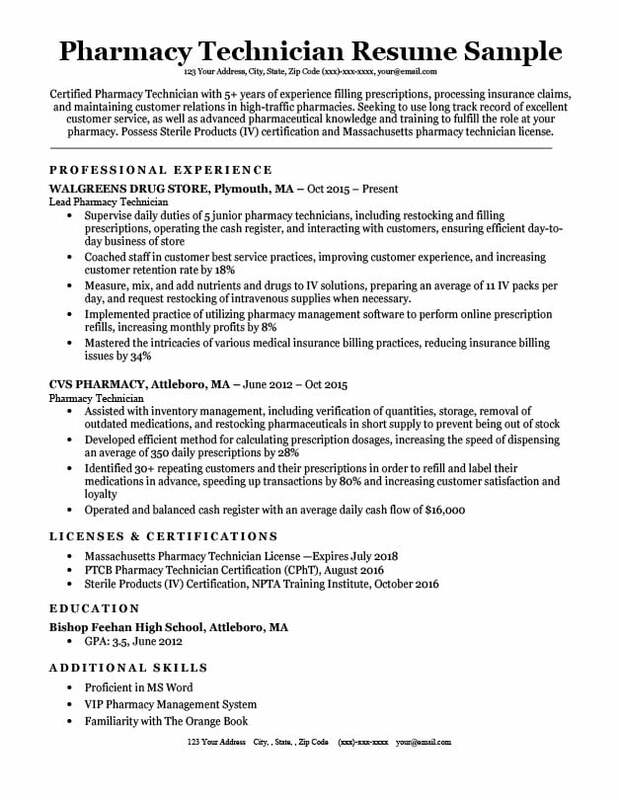 Certified Pharmacy Technician with 5+ years of experience filling prescriptions, processing insurance claims, and maintaining customer relations in high-traffic pharmacies. As you can see in our example, the candidate wastes no time at all in showcasing their knowledge and abilities in the very first word: certified. This immediately tells the hiring manager that this candidate knows what they are doing, and compels them to read further. If you’re not certified, use another word with similar oomph, such as dedicated, hard-working, or even just experienced to start out. Anything that can tell the hiring manager you mean business. As we said in our first tip, you want to showcase the things that are most valuable to pharmacists. To this end, when listing your basic responsibilities in your career objective, you want to choose those with the highest value. In addition, remember that the space on your resume is limited — so even if you have a lot more, try not to list more than three important responsibilities. Seeking to use long track record of excellent customer service, as well as advanced pharmaceutical knowledge and training to fulfill the role at your pharmacy. In this sentence you are telling the hiring manager your best traits that will make you an asset in the role you are applying to. 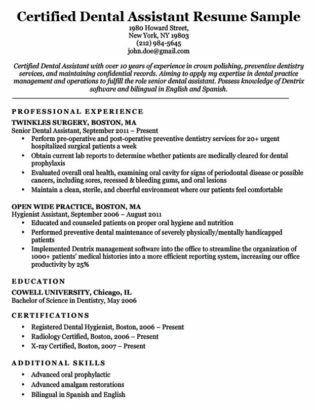 In your own resume feel free to be less broad and mention specific skills or knowledge you have that would be of particular value to the pharmacy you are applying to. If you lack hard skills, it’s also a good idea to emphasize soft skills highly sought after in pharmacy tech candidates, such as communication, attention to detail, and the ability to work independently. Possess Sterile Products (IV) certification and Massachusetts pharmacy technician license. This last sentence is self-explanatory but is still a vital piece of the puzzle. Simply list any relevant certifications, training, education, and in this case licenses you may have. It is essential to include this in your career objective because it is important information for the hiring manager, and you want them to be able to find it as easily (and as soon) as possible. On average it only takes a hiring manager 6 seconds to evaluate whether a resume is worth looking at, so make sure you leave a good first impression with your career objective! The professional experience section is where you can really put the spotlight on your achievements and prove your worth. The most important thing to remember when writing your experience is that you don’t want to tell the pharmacist what you’ve done, you want to show them what you have achieved. In this way you can demonstrate your value as a pharmacy technician. This is an essential part of your professional experience section. Never make the mistake of saying you are “responsible for something.” Remember there is a big difference between being responsible for something and doing something well — being responsible for a child, doesn’t make someone a good parent. As a pharmacy technician, you are trying to display exactly how effective you will be when assisting the pharmacist. To do this you must use your professional experience bullets to show you are a man or woman of action. Notice how much stronger the second statement is — by starting with an action verb you make a bold statement that shows you are not only responsible for this task, you proactively do it. Rather than simply listing your work responsibilities, choose duties that have a real positive outcome when completed, and then emphasize that outcome. Here the candidate not only lists their responsibility, but also the results of their actions. In this way they showcase the effectiveness of their coaching, thereby proving how they can be of value. As we outlined above, showcasing the results of your actions is an essential part of a strong work experience section. Quantifying those results by adding numbers is equally important because clearly shows just how effective you are to the hiring manager. As such, try to quantify as much as you can. How many prescriptions do you fill per day? How many medicines do you help measure and mix? How many junior pharm techs have you trained? How many customers/patients do you deal with daily? How much have you increased the pharmacy’s profits? How much have you increased customer retention? By following these steps you will create strong bullet points that prove your effectiveness, and get you hired. The professional experience section of our how to write a resume guide is another excellent resource if you feel you still need more help. Always include a section with your certifications and training. In a technical field such as pharmacy, nothing opens doors quite as well as pharmaceutical training and knowledge. Although a lot of starting pharmacy technician positions usually don’t require one, a PTCB certification will always be preferred. Do you have the proper certifications? More importantly, if you’re trying to advance your career outside of retail, pharmacy tech certifications become a necessity. Especially when it comes to more specialized pharmaceutical techniques such as nuclear pharmacy, and IV preparation. With these types of qualifications on your resume, your pharmacy tech career will have the fuel it needs to take off. A lot of times there are certain skills or knowledge that pharmacists want in a candidate that are difficult to include in other parts of your resume. For example, most pharmacies want people who are proficient with Microsoft Office, but it would be a waste to include something so basic in your career objective or professional experience. Use the additional skills section to include your basic or bonus skills and save previous space on your resume! The additional skills section is the perfect place to include any such basic, but essential skills. It is also the perfect place to showcase any other special skills or knowledge you were previously unable to include. In our resume sample we included the candidates knowledge of pharmacy systems as well as the orange book, which deals with the general substitution of medications. Both of these are key things that a pharmacist would find valuable in a candidate. By following these tips your pharmacy technician resume will have all the equipment it needs to prove that you are the best possible assistant for any pharmacist. If you’re ready to get started on your perfect resume, download the free sample above — or browse our expansive list of free resume templates!